I guess this year my real focus is on well being. Over the past few months work has really got on top of me and has left me feeling stressed, anxious and well, unhappy. I'm not going to lie, I don't really enjoy teaching anymore - but that's a whole post in itself! My goal for this year is to stop work from taking over my life and start to strike a better work/life balance. To me it's fairly basic - the more enjoyment you get from things outside of work, the less emphasis is placed on work itself. When work becomes and be all and end all, its not surprising you get stressed and worn down. I want to start off by learning some new skills or finding something I enjoy doing. First up I want to take an Indian Head Massage course; something to help me relax and hopefully I will be able to find a friend to come along. My Mum is already trained in several holistic therapies including IHM and she swears by them to help relax and improve her general well being. If you are looking for reasonably priced, day-long courses (or longer) its worth checking out your local FE college. I teach in one, and the Adult Education section has some great options - I've also got my eye on a Stress Management course (! ), Furniture Painting and Digital Photography. Why not - you've got nothing to lose, and could gain a new hobby and skills. This is something I've wanted to do for a while! I love reading (check out by bookworm feature) and swapping book recommendations with friends - this would be a great way to meet like minded people and try new reads. Its so easy to stick to a genre, or follow the hype - as a result I've not read some real classics or books that are off the radar. I just need to find a group to join or other folks to start one with! Those are the first two goals on my list - I don't see the point in writing hundreds of things as that just won't be achievable. Can you think of anything else I should do? Hopefully you will love the IHM course. As well as being a hairdresser I am also a Complementary Therapist and holistic treatments are so calming to give as well as receive. How about doing a short cookery course too? You always have lovely recipe posts on your blog, maybe you could share even more lovely recipes with us! I definitely feel the same about work in a regular basis. I've planned to take a similar philosophy in terms of thinking about how I feel. I know that if I eat rubbish food I feel rubbish so although it's not about dieting hopefully a little bit of weight will drop off too! I think your list sounds great and it's probably one of the best goals to try and achieve a work/life balance. I know that abeautifulmess are doing a bloggers book club if that's of interest of you, I'm thinking of joining it but haven't fully made my mind up yet! I'm so with you on this, I really dislike my job and end up spending most of my time on an evening worrying about going back the next day rather than enjoying my time away! I'm planning on looking into courses too, Indian Head massage looks pretty awesome - I'd want tom to go though so he could practice on me! Oh gosh, I have wanted to be in a Book Club for so long! I need to find one near me, I miss talking about books! I think finding a good work/life balance sounds great. Like someone else said, I wouldn't mind doing an IHM course, but possibly just so I could get a massage! 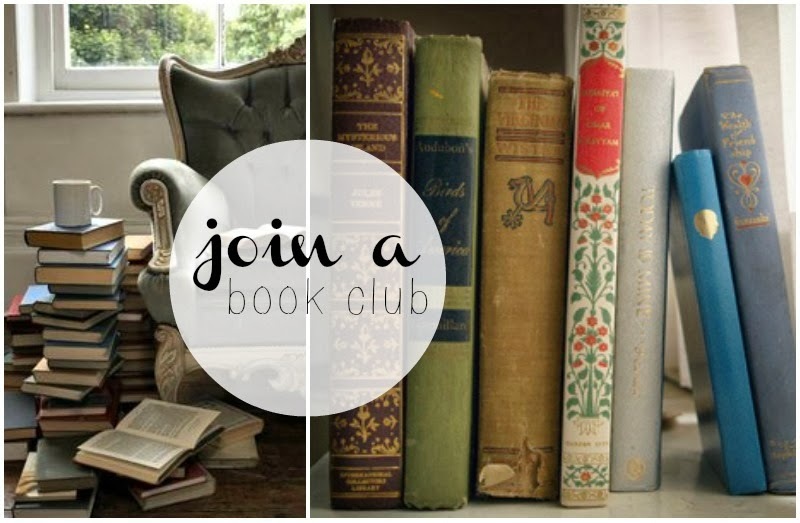 I love the idea of joining a book club - there's nothing better than reading in my opinion. But I'm a bit of a slow reader so I'd worry about being left behind!